WASHINGTON — President Barack Obama will nominate Dr. John B. King Jr. to serve as Education Department secretary after receiving commitments from lawmakers to give his nomination speedy consideration, the White House said Thursday. 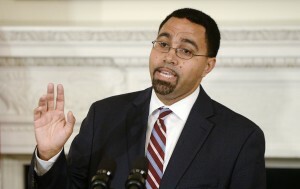 King has served as acting secretary since Arne Duncan stepped down at the end of December. Facing strong Republican opposition to many of Obama’s nominees in the Senate, the White House opted to skip the potential clash over education policies and said it didn’t intend to nominate another candidate. King’s selection could move ahead as Congress wants to see the new education law implemented, which passed with strong bipartisan support last year. “For proper accountability … it is important to have in charge of the department a member of the president’s cabinet confirmed by the United States Senate,” Alexander said. King oversaw federal education programs for preschool through 12th grade before becoming acting secretary. Before joining the department King had worked as a teacher and principal. He also co-founded a charter school that became one of the highest performing urban middle schools in Massachusetts. He then served as New York State’s education commissioner, overseeing elementary and secondary schools, as well as the state’s public colleges and universities. He was the first Afro-Latino to hold that job. “There is nobody better to continue leading our ongoing efforts to work toward preschool for all, prepare our kids so that they are ready for college and career and make college more affordable,” Obama said. Both of King’s parents died before he was 12, and King credits public school teachers in New York City with giving him hope and purpose. “John knows from his own incredible life experience how education can transform a child’s future,” Obama said.